If you’re anything like us, you bookmark various interesting articles and webpages throughout the day, but thanks to the dual temptations of the sofa and TV, never find the time to actually read them. That’s where Spritzlet comes in. This little browser extension slashes the time it takes to read text on a screen by displaying words one at a time in quick succession (a technique known as Rapid Serial Visual Presentation) so you can absorb them without moving your eyes. Its developers claim that with a little practice, it can help you read as many as 1,000 words per minute. It sounds strange, but it really does work. You can check out an example of the technology in action on the developer's homepage. 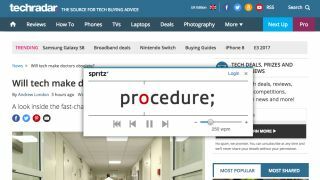 The Spritzlet extension is designed for desktop and mobile browsers, and works with Chrome, Safari, Firefox, Opera and Internet Explorer. Just drag the button into your bookmarks bar to install it. Next time you want to power through an article, click the Spritzlet button and focus on the red letter to begin reading. There’s a slider to adjust the speed, and a pause button if you need to take a break to process what you’ve just read. If you only want to read part of a page, select the text before pressing the button. Registering for a free account lets you read at speeds below 200wpm or above 450wpm, and lets you save your preferences as you move between sites, but it’s not essential.